There is something you should do but it is very hard to do. It is difficult and challenging and easy to avoid. As a leader in a CPA firm, you read about new trends. 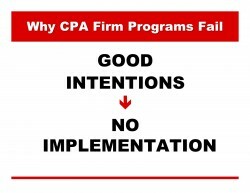 Many of you attend one or even more CPA firm management conferences each year. You are involved in your state society and take an active part on committees, etc. During these activities, you learn about what your firm needs to do to move successfully into the future. You bring these ideas back to your firm. If you are a partner you probably set the date for a firm leadership (or partner) retreat. You spend a lot of money on the venue and the facilitator. You make sure that the new trends are on the agenda of the retreat. At the retreat, the need for change and the adoption of the new trends into the firm is heartily agreed to by the attendees. A strategic plan or action plan is developed. Everyone is excited. In the weeks and months following the meeting, nothing happens. You are too busy. It seems everyone else is also too busy. "The best way out of a difficulty is through it."